A native Nevadan, I was raised in the once illustrious mining town of Pioche, where I graduated from Lincoln Co. High School, followed by University of Nevada at Reno, where I majored in English literature with a minor in History. After a long career in insurance, I have returned to my roots and enjoy spending my time writing about the things I love most – the State of Nevada, its history, and the colorful citizens who crossed its borders and decided to stay. Tell us about the books you’ve written and a short synopsis? In 2012, I wrote “Blue Sky and a Buick” – a biography of Deaconess Mary Hettler, a missionary woman who was sent by the Episcopal church in the 1940’s from Chicago to Pioche to run the small church there. 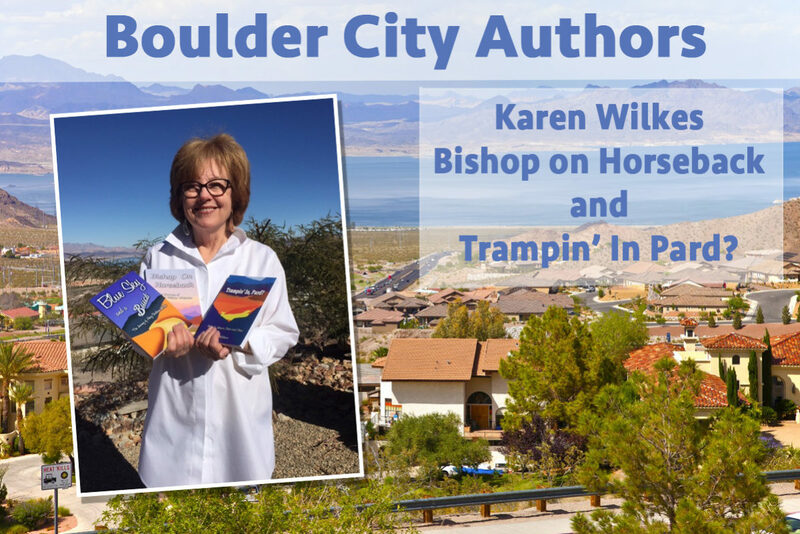 This is the story of a woman’s journey trying to hone her ministry within the confines of a traditional church structure, while in reality living in the outback of Nevada. In 2014, I wrote “Bishop on Horseback” – a biography of Ozzi William Whitaker, the first Episcopal Bishop of Nevada, sent from New York to Virginia City in 1863 to minister to the miners during the gold and silver rush. Again, why did he accept this assignment, and why did he stay. In 2017, I wrote “Trampin’ In, Pard?” – the biographies of four different Nevada miners who mined during four different eras. The four stories combined tell the social history of miners from the turn of 20th century up to today. As I matured, I realized that my upbringing in a mining community was truly a rarity, and that I probably had something to offer about the history of mining in Nevada and of the lifestyle of those who mined. I was also interested in the history of the Episcopal church in Nevada, resulting in the first two books about missionaries. What do you hope your readers will experience or learn from reading your work? I hope that my readers will be able to smell the Nevada sagebrush, taste the dust in its deserts, and feel the cool air in the darkness of its mining tunnels. And, that they will feel that they know the type of people who came here looking for fulfillment in their ministries, or a better life for their families by working in the mines. When and how did you publish your books. With the help of my husband, Darryl Martin, we self-published each book through several internet providers. The last book was published by Amazon, which we liked very much – lots of work in formatting, but the result was good. All three books can be purchased from Amazon in print or Kindle version. I helped my dad put a bunch of his stories about growing up in Pioche in the 1930’s into a book, “High Desert Tales,” and my husband started our journey with self- publishing with that book. I realized that I loved helping my dad with his writing, and after we finished, my mind just started turning summer-salts with ideas about Pioche and its citizens. Mary Hettler jumped into my brain and wouldn’t leave. I knew I had to write her story. Then, Ozzi Whitaker moved in, and there was nothing to do but write his story…..then, came the four miners…I had no choice but to write these books! Did you take informal or formal classes or seminars in writing? What would you say to other would be authors about the process of writing? Well, I did spent four years at UNR reading the classics. I stayed away from creative writing classes, because I didn’t think that I was creative, and that I would get bad grades. (oh, how we become our own worst enemies!) I also had minored in history. I did not know that it would be 40 years before I really put my education to use. This certainly proves that education is never wasted! Regarding advice to other authors, I can only say, that in my case, I arrived at a point of feeling inspired and almost driven to write. I was methodical in my pursuits, because I knew when writing non-fiction, that I had be to totally accurate and that I had to get these stories into a readable format. Therefore, I established all sorts of folders to retain research in an organized manner – so easy to lose documents, etc. And, I made very thorough outlines to follow so I wouldn’t forget details and where they needed to go. I put the outlines on butcher paper and taped them to a wall, so that I could look at them at any moment – that was helpful. I also put timelines on the wall. From there it was just a process of following the outlines and trying to get a rough draft done. I then re-write each book about five times to get the needed result. Yes, it’s hard work! But, very rewarding.